Weighty Matters: Issues with "Based on a 2,000 Calorie Diet"
"Based on a 2,000 Calorie Diet"
That's the wording you'll find in the footnotes of our nutrition fact panels. Moreover it's repeated in the media regularly. Is the regular printing and reporting of a population average that includes men and women, tall and short, sick and healthy, young and old, active and inactive, a good idea even if it does have the proviso that yours may be higher or lower? I understand that the numbers are there for the ridiculous and frankly nutritionally disinformative breakdown of "nutrients", but I would imagine that for many they serve as a caloric anchor. Something to aim for that's safe. Yet the average woman on 2,000 calories will almost assuredly gain weight, while the average man on 2,000 calories will almost assuredly go hungry. We need nutrition fact panel reforms. 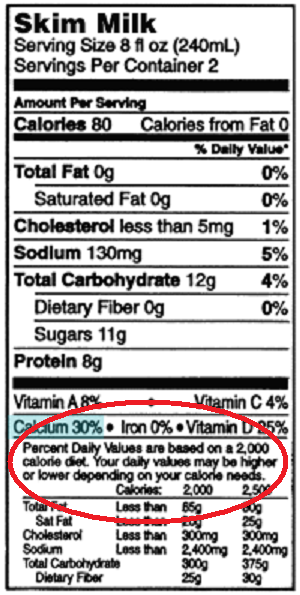 We need to de-emphasize the nutrient based approach to box-based nutritional disclosures and actually emphasize real world portions, and I think part of those reforms needs to include more useful caloric guidance and at the very, very least, providing average values for men and women separately. Calories are definitely not the be all and end all of nutrition, but they're certainly a major determinant therein. 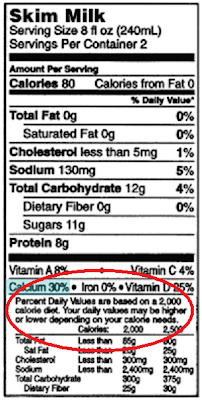 We need a better way to inform the public about their calorie needs than simply reporting on an average. Have you ever aimed at 2,000 calories because that's what was reported to you as appropriate?